If the lifestyle you want is traveling all the time, all-year-round, and constantly going to new places, a recreational vehicle will be perfect for you. Talk about a freedom lifestyle! But not all places are the same, and seasons change with time. When your next destination is a place with low temperature, or when your next trip happens in winter, there’s nothing better than having something that keeps you warm and cozy as you go on your adventure. And that’s exactly what an RV heater is for. If you bought your RV, chances are it came with a built-in propane heating system. However, there are those who prefer electric-powered systems instead. For those people, and for the people who custom-build their RV, this is the guide for you in order to make sure you don’t make any mistakes in buying your next RV Heater. Whether it’s just for having an extra one, or for replacing the existing one, or even for building a new RV entirely, if you’re going to buy a heater, you want to get the one that serves your needs best. And to help you with your decision, there’s also a list of our top 10 best choices to buy this 2019. But first, what are RV heaters? Why buy an RV Heater? As the name suggests, RV heaters are used to help heat up your vehicle during cold weather. This is accomplished by producing heat through a heating device, which is then spread throughout your mobile home. If your heater is gas-powered, it will also have ducts and vents strategically spread out over your RV that release the heated air. If your heater is just a small, portable one, expect it to only heat up its surrounding space. However, the space it can heat up also depends on the model. The method that the RV heater uses in order to increase the temperature depends on its type. There are two major categories of RV heaters: gas-powered, and electric-powered heaters. There is also the oil furnace, but this is used more as radiators as opposed to heaters. The following is the description of each type, as well as how it differs from the others. This type of heater provides heat using combustion. First, an ignition (either a pilot light or electric) lights up the burners found inside the combustion chamber. These burners provide heat which then flows to another chamber which contains air, this air will then heat up, resulting in the increase in temperature. When the air within the second chamber reaches the desired temperature (the temperature of the thermostat), it is blown throughout your mobile home via the network of ducts and vents. When it comes to gas heaters, they are normally powered by one of two fuels: natural gas and propane. Propane gas is man-made and is better for the environment, due to the lack of harmful gases released during combustion. Not only does this mean less risk for you, but it also makes propane gas better for the environment, unlike natural gases which release greenhouse gases when burned, which contribute to global warming. There are also downsides to gas heaters. Firstly, it needs gas to work. Thus, it needs regular refilling, especially if you use it constantly. Second, it is also dangerous due to the highly flammable nature of the fuel used. This means that it is imperative to ensure that there are no leaks anywhere that can allow the gas to escape. In general, full-range gas heaters cost more than electric-powered ones, mostly because it requires the installation of ducts within the RV. Keep in mind that it is also cheaper to run and easier to maintain, making it a better choice in the long-term. Additionally, it does a better job of warming up the entire RV due to the ducts being spread throughout. In cases where you only need to warm up a small area around you, portable propane heaters are also an available option. One thing to take note of regarding propane heaters is that they still require minimal amounts of electricity in order to run. However, they only require a DC connection capable of supplying 12 volts, which can easily be provided by the battery of your RV. As it says in the name suggests, electric heaters make use of electricity, which it converts into heat. To do this, an electric current is passed through a resistor, which dissipates the current into heat. Instead of having a chamber for exchanging the heat along with a network of vents, the heat produced by electric heaters is just released through an open vent, aided by a blower and sometimes electric fans. Because of this, the dispersion of heat is comparatively slower, especially without electric fans to aid in spreading. However, unlike gas heaters, electric heaters do not have any byproduct so it’s 100% safe for you and the environment. An important trait of electric heaters you should be mindful of is the fact that they can only heat up a relatively small area around their heating coils, which can either be good or bad depending on what you need. If saving energy and money is a priority, then this is the better option since it only heats up specific spots in your mobile home. However, if you want your entire RV to be nice and cozy, electric heaters might not be up to the task. Another point of importance is that electric heaters, much like gas heaters, can also be dangerous. Unlike built-in gas heaters, electric heaters aren’t built into the RV itself. This means there’s a chance they get tipped over, which can result in an accident. If your RV is solar-powered, know that electric-powered heaters can consume a significant amount of energy, which can vary depending on the model. Make sure that your power source can adequately provide enough energy for both your heater and other essential appliances that are also powered by electricity. Oil furnaces function in the same way as gas heaters. Oil is burned in a sealed chamber within the furnace, causing the temperature within a second chamber to rise. When the temperature within the second chamber is at the desired temperature set in the thermostat, the hot air will be blown through the ducts and out the network of vents. Not only do oil furnaces heat up just as quickly as the other gas-powered heaters, but they also last longer. Oil is also safer than the other two because it is non-combustible, even if it leaks out. It also does not have a carbon monoxide by-product. However, oil furnace heaters are uncommon, since oil furnaces are generally used as radiators instead. RV Heaters allow you to control your motorhome’s temperature, so you can prevent the cold climates from freezing you up, along with your company. It also helps your RV and all your other appliances that may be ruined by condensation or the cold. Finally, the best part about RV heaters is they enable you to go on adventures even in places with cold climates. You want your RV heater to be a long-lasting investment. It won’t do you any good to have it die on you in the middle of your third drive after buying it. It should be able to handle the drive even through the roughest roads. How many resources does it need to heat up a certain amount of space? Different heaters have different BTU (British Thermal Unit), which refers to the maximum area that it can warm up effectively. For example, warming up an area of 150 square feet requires 5000 BTUs, and 300 square feet requires 7000 BTUs. Another point of notice is also the time it requires to heat up your space. Is it the type that turns on and off frequently, or does it stay on to maintain the temperature for an extended period? This depends on the type of unit you choose. For example, the DeLonghi Radiator is normally used for maintaining the temperature, because using it for heating up an area will take hours. You should also look into the difficulty of maintaining the heater. If you’re inexperienced about RV heater troubleshooting, low-maintenance heaters should be preferable. What other useful features does it have? Try to choose something with safety features. Since a heating system can be dangerous when taken care of improperly, you want to buy something that can take care of itself in the worst-case scenario, such as an auto-shutdown feature when it gets tipped over, or a built-in CO and CO2 sensors. Look into the price and decide if it’s justified by the features and capabilities of the heater. 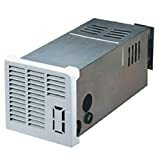 If it’s something small like a portable heater capable of heating up only around 50-100 square feet, expect the price to only be around $100. If it’s something bigger, such as a full-range centralized heater, the price will definitely be at least $500, even more depending on the brand and other features. Our first heater is perfect for those who like it old-school. The Lasco CD09250 makes itself stand out in a market full of heaters with digital settings controllers by having knobs instead. Despite this, the manual controllers still do their job perfectly well. One of the knobs is for setting the mode: high heat low heat, or fan. Meanwhile, the second knob is the one responsible for allowing you to control how much warmth you want it to provide; in short, the second knob is a thermostat. Quick and easy. Its construction is made from thick plastic, which remains it remains cool to the touch at all times. This is accomplished through the use of a ceramic element that is capable of automatically regulates its own temperature. This feature comes in handy in case you want to move the unit around or get it from point A to point B. Do note that the ceramic element means that this heater can’t be placed in areas of above average humidity, such as the comfort room. The fan option is also a great option to have if you’re the type to heat your home up to a certain temperature then let the fan do the rest, or when you need to cut back on energy. The heater is also portable so you can place it wherever you want. This particular model also shuts down automatically once it senses it is overheating. However, this unit lacks the capacity to automatically shut down whenever it gets tipped over. The Camco 57351 Olympian Wave-8 LP Gas Catalytic Heater is propane-powered so it doesn’t require electricity if a power supply is a concern. It’s also a wave heater, so it radiates comfortable heat. Instead of heating up the air, it warms up the people first, along with the objects, floors, and walls, so you’ll immediately benefit from the warmth it provides. 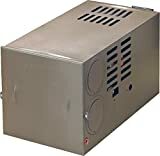 This heater can be placed on the floor or mounted on a wall. 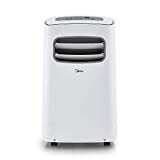 One good thing about the Camco 57351 Olympian is that even though it’s meant to be used as an auxiliary heater, it still works great as a primary heat source for your mobile home, capable of providing up to 8,000 BTU, meaning it can easily provide warmth to a space of around 350-square-feet area. And this heater also does it fast. Another benefit of getting the Camco 57351 Olympian is its ability to remain quiet even while being used. Others RV heaters tend to clatter when in use, but this one just functions perfectly while remaining silent. Perfect for when you want some shut-eye in a cold climate, this heater can easily keep it nice, warm and comfy, without any sound to distract you from your sleep. However, you should take note that the Camco 57351 Olympian uses HD-5 propane gas exclusively. It’s true that HD-5 is the most distributed variant of propane gas, you should still be careful not to accidentally use HD-10 as it could be more common in other places such as California. In terms of features, the Camco 57351 Olympian has the feature to automatically shut off the valve but has no option for fine-tuning the temperature. Small though it may be, this heater is built like a tank. The case is composed of metal, with thick plastic lining the edges to prevent accidental tipping. Thick plastic was also used for the handle, which also means that the device can be easily transported with absolutely no worry about its heat. The construction and design mean that this device is very durable if that’s what you’re looking for in a heater. Its size is relatively small, which may make you feel doubtful about its capabilities. But rest assured, the Broan NuTone 6201 is capable of everything you expect from it. However, it does take a while to reach your desired temperature, especially when you leave it at a low setting. A trick you can use in order to warm your place up faster is to immediately set the heater to its highest setting. Once it starts becoming warm enough, you can then turn down the setting to what you want. Take note that when you’re first using this device, you might get a strange chemical odor. Fret not, this is normal, and often happens when you first run a brand-new heating device (although certain brands have ways to make the smell negligible). If it’s a bother, just leave it out in open when you first run it. If what you need a portable heater that can be placed anywhere you want, this is the one for you. It is small, durable and can heat up space fast (if you raise the setting to maximum). If you want something a little smaller, the Handy Heater is a great option for its size, measuring at only 6.2 inches high and 3.3 inches thick, with the whole thing covered by a metal casing. The Handy heater is also powered by electricity and consumes 350 watts of power. Due to its low power consumption and portable design, you can use it anywhere you want, so long as there’s a power source such as a plug. One good thing about the Handy heater is its automatic timer function, which has options for high and low settings and can be programmed for up to 12 hours. A great feature for the forgetful types. A major downside to the Handy Heater is the fact that you have to set the settings, including the temperature, manually every time you use it. This means that if you turn it off sometime during the night, you’ll need to get up and manually input your desired settings again before you can use it. This issue is made worse by the fact that the temperature controller is a tad difficult to push when increasing the heat by a little (although this may be because it’s new). Having the option to have presets would go a long way to improving usability. Do note that the Handy Heater is only capable of heating up small spaces, roughly around 100 square feet only (as opposed to the 250 square feet that were advertised). Luckily, if your space is around that size, this RV heater can warm it up relatively quickly. Sadly, the Handy Heater doesn’t feature any sort of safety feature. The clumsy ones among us should be careful when buying this product. What a mouthful. Mr. Heater’s new heater is propane powered and designed to be portable, meaning you can take it around with you. Perfect for when you’re in the mood for camping out. A single look at this product shows that it was designed for maximum safety. It will automatically shut itself off whenever it detects that it’s been toppled, or when it detects low oxygen level. It also shuts down if its pilot light is snuffed. A great feature to have, especially if your campsite has a lot of flammable material. Since it’s gas-powered, you’ll need a propane supply to power it. Don’t worry if you’re camping out, even a small canister of propane should be sufficient. If you’re using it inside your motorhome, the propane tank can also serve as the power source. The heater can easily heat up a 225-square-foot space. If your place is bigger, you can always use the maximum setting (and have a fan aid the spread of heat). Do note that increasing the setting might use up more propane. If you’re planning to use this heater overnight, have a tank with 5 pounds or more of propane fuel. This heater requires a considerable amount of resources, with each pound of propane only good for about 5 hours of use, even when the setting is set to lowest. Having a device for detecting carbon monoxide is also advisable, especially if you’re planning to use this heater in an enclosed area most of the time. Gas heaters with a central heating system normally have an exhaust vent leading outside, but this one doesn’t. It’s advertised to have 100% efficiency, but it’s always better to be on the safe side. Finally, this heater is quite silent and does not vibrate, even while operational. Perfect for when you want to have those cozy nights sleeping peacefully in a tent outside. Don’t let its medium size fool you, this heater is quite the capable one. At high setting, it only takes around 20 minutes to warm up an average trailer. This performance is on par with other, full-sized furnaces, despite being relatively portable. This RV heater is also designed to be durable. While other RV heaters might overheat when working for too long, this RV heater’s material is strong enough that it’s possible to maintain the (impressive) heat for long without having to worry about internals. Its material is also highly resistant to meltdowns. Bovado USA 166648 also has several safety features. It has an overheat protection system, which shuts the device off if its components reach a certain temperature. It also has a Safety Tip-over switch, which allows the device to automatically shut itself off if it falls over. However, one downside of this heater is the noise. Something to take note of if you like to keep your heater running while you’re asleep because the noise from the fan might wake you up. The Bovado USA 166648 makes use of two knobs for controlling the settings. The first knob is for switching between the three modes, you can choose either high heat, low heat, or fan. The second knob is a thermostat for fine-tuning the temperature. This device also runs on electricity, so you can take it with you and use it anywhere, as long as there’s a power source. If you can deal with the noise, the Bovado USAs 166648 is a portable and durable heater. While not very fancy, this unit is very dependable both in security features and capability in heating up your space. This one is a propane-powered heater that uses an electronic ignition instead of a pilot light. Electric ignitions are more cost-efficient than pilot lights since they’re not on all the time. The burners will only activate if the furnace is turned on. To enjoy the full heating capability of the Suburban NT-30SP, getting the full package is highly suggested since it includes a vent system. The installation of the whole set is relatively easy, it only takes two or three hours for the entire set-up. This already includes the installation of the system of ducts and the aligning of the ports as well as the vents. However, if this is your first time setting up and installing such a system, it’s easy to find yourself becoming intimidated by the work. In terms of heating, the Suburban NT-30SP puts up quite a performance. At its maximum, this heater can reach 30,000 BTU, meaning it can heat up an area of up to 2,000 square feet, more than enough for the average RV. Combine this with its vent system, and it can easily warm up your entire RV in no time at all. No more frosty doors or windows, no more chilly rooms. With this heater, your entire RV will be a warm and cozy wonderland, even in winter. Especially if your motorhome is a large one, with a number of rooms. The vent system will make sure that each one is as warm as the others. The biggest downside of this furnace is expected. Because it has to heat up your entire motorhome, instead of just a small space unlike the other items so far, the Suburban NT-30SP consumes a significant amount of gas. 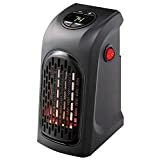 It’s also much more expensive compared to the other portable heaters in the list so far, which is understandable given that it’s bigger and much more capable. If you’re looking for a new furnace, and you want your next one to last long, this one is worth considering. Not only is it capable in terms of providing heat, it’s also extremely durable. This furnace can be depended on for around at least two or three decades, maybe even more. It’s a long-term investment, unlike the other options, but it’s definitely worth it. The Q in the Suburban NT-16SEQ stands for quiet, meaning it’s similar to the NT-16SE in almost all aspects except one: its silent operation. To accomplish this, the noisy blades in the fan used in the NT-16SE were improved so that they not only produce less noise but also vibrates less. Just like the NT-30SP reviewed previously, this unit is also propane-powered. This also makes use of electronic ignition. However, this vented heater is smaller and can “only” output up to 16,000 BTU. But this is still enough to power a relatively large, 800-square-foot area. Another difference from the NT-30SP is that this unit has a ductless design, which also makes it easier to install. For safety purposes, the air intake is vented outside the RV, along with the combustion exhaust. Another safety feature is its ability to sense whether there’s a flame or not; if it detects that the flame is out, the gas valve will automatically close. The NT-16SEQ requires 12-volts to run which your battery can adequately supply, meaning you don’t have to necessarily go to a specific RV park to use it. Additionally, this unit also works great even if you’re just using solar-powered DC batteries. Since it only needs power for the circuit board as well as the fan, its power draw is very little. Just like the NT-30SP, this heater is also a long-term investment due to its cost. Similarly, it will also last you for at least a couple of decades, and most likely more. However, even though it’s smaller than the NT-30SP, it is still not portable. The Lasko 755320 Ceramic Tower Heater is one dependable RV heater. In terms of durability, this 23-inch heater is made of quality materials that can easily withstand high temperatures. The cover constructed from top-quality fiberglass, which also means you can touch it and not worry about getting burned. The handle also functions well so you can easily take the heater with you when moving from one place to another, even if the unit is running. The Lasko 755320 also has a boatload of features. First is its oscillating feature, this allows the unit to keep the temperature nice and even throughout the space. Second is its self-regulating feature, which includes an auto-off timer which maxes out at 8 hours. This allows you to have the peace of mind to go about your day without worry. Finally, its best feature is probably the multi-function remote. When you already have the heater up and running, you can easily adjust the settings with the remote. No more standing up and walking to the heater when trying to find the right temperature. This feature is great for the lazy among us, but it’s definitely a blessing to anyone with mobility issues. Another great use of this feature is you can keep the remote beside your bed at night, so you can easily adjust the settings or even turn it off while half-asleep, without having to stand up and walk to the unit itself. In terms of power, the Lasko 755320 is rated at 1500 watts, and can warm up an area of around 180 square feet. Not only that, but it also does its job in a relatively short time. One problem with this heater is that it lacks a safety feature which allows it to turn itself off whenever it detects that it’s been tipped over, which is important considering its design makes it vulnerable to being accidentally toppled. If you have kids or pets that tend to roughhouse or run around, be careful with buying this heater. Unlike the other items in this list, which are all actually heaters, the DeLonghi EW7707CM Radiator is… a radiator. This means that it radiates heat which increases the temperature in a room gradually. This also means that when it comes to heating up an area, the DeLonghi is slower compared to other heaters. However, this device can maintain that comfortable temperature for a longer time. Since it’s a radiator, it normally takes around two to three hours in order to heat up the space in your RV. Because of this, it’s advisable to keep a secondary heater which you can use to quickly heat up your motorhome. Once your second heater gets the room nice and cozy, you can turn it off and switch to the DeLonghi Radiator to keep the temperature level for a longer time. The DeLonghi EW7707CM Radiator is powered by electricity. It can use up to 1500 watts, but its lowest setting will only use around 700 watts. Speaking of settings, the device has 6 levels of heat that you can choose from. If you’re having trouble choosing, the DeLonghi Radiator has a nifty feature called ComfortTemp, which automatically chooses the setting needed for optimal room temperature. Additionally, the oil in this radiator doesn’t need refilling, which keeps the costs down. And because it’s electronic, there’s no issue with burning gases. Its design is also pretty stable, which minimizes the chances of getting tipped over. If you buy this radiator, you may notice a chemical smell when you first turn it on. Don’t be alarmed, because this is normal and will eventually disappear. However, it’s advisable that when you first use this device, you should leave it running outside until the burning chemical smell disappears. The top 10 RV heaters you can buy right now. If you can afford one, there is literally no reason why you shouldn’t have a heater in your RV. It has tons of benefits with absolutely no downsides. The only problem in buying an RV heater is deciding which one is the best for you. Is your RV a big one, with a number of rooms to accommodate your entire family? A centralized heater would be the best option, so it can heat up all the rooms evenly. You also need to make sure that your heater has enough BTU for all the space in your RV. If your RV is a small one, just enough for yourself or a company of one or two, then you might want to buy a small portable heater instead. It’s much cheaper and allows you to save up on fuel or electricity. The best part about portable heaters is that you can take it with you anywhere you want, even outside if you’re in the mood for camping in a tent. There are numerous factors that come in when you’re choosing your next RV heater, but always remember that safety should always be the main priority. Especially since there’s a good chance you’ll be running your heater while you’re asleep. Know the possible hazards of your place, such as whether you or your company are clumsy, or if there are kids or animals that tend to run around a lot, and choose the RV heater with the appropriate safety features. If you don’t know where to start, then check the list above for suggestions. If you need any more help in choosing your next one, here is a list of frequently asked questions (FAQ). How do RV furnaces work? RV furnaces work pretty similarly to the furnace you have in your home. There is a centralized heating system where the air is heated up. This air is then sent through ducts to the vents located throughout your RV, where it is blown out into the space. For ductless furnaces, the heated air is just blown directly through the furnace’s vent. Tankless water heaters work slightly differently. How do I keep my RV warm during winter? It depends on how large your RV is. If you’re alone and you just want to keep a small spot in your RV warm, then a portable heater should be enough for your needs. If your RV is huge and you’re traveling with family, a centralized heating system is suggested to keep all the space inside warm and cozy. If you want your heater to function quickly, get one powered by either electricity or natural gases. Oil-equipped radiators work slower, but they maintain the temperature for a much longer time. A combination of the two, a heater to raise the temperature, and a radiator to maintain it, is ideal. 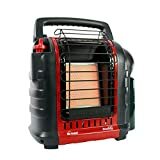 Are there any alternatives to propane heaters? You can choose either natgas (natural gas) heaters, or electric-powered heaters. You also have the option of getting an oil-based radiator instead, but these may take longer in heating up your motorhome. How to keep my tent warm while camping? The best option is propane heaters, choose a portable one which can function with just propane canisters. Another option are RV wood stoves, which have inherent risks due to the flammable nature of the items necessary.